Daily video game bargains and freebies from online retailers. Don't miss out on these short-lived deals. These lists display the cheapest price available for every single game on the PS4 and XBOX One. Own Alien Isolation for less than a tenner. Although it’s getting a bit on in age now, at this price, it’s not going to break the bank. This price currently beats all other retailers at time of posting. Discover the true meaning of fear in Alien: Isolation, a survival horror set in an atmosphere of constant dread and mortal danger. Fifteen years after the events of Alien, Ellen Ripley’s daughter Amanda enters a desperate battle for survival, on a mission to unravel the truth behind her mother’s disappearance. 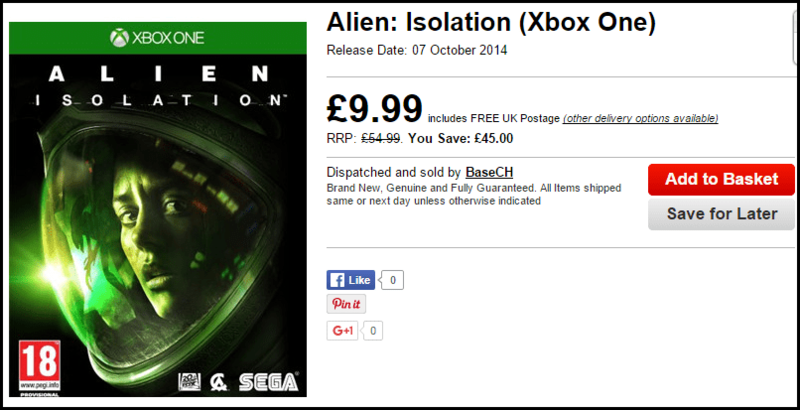 View prices at other retailers on the Alien Isolation price comparison page. GamePricer's owner. Enjoys gaming without breaking the bank. Software/hardware mod enthusiast. Retro gaming handheld collector. Works full-time in digital media. Looking for the best possible video game deals, or just want to know which retailer offers the cheapest price for a specific game? GamePricer has you covered. Daily bargains and freebies from online retailers. If we find a good video game deal, we'll post it here. Find the cheapest price available for your chosen PS4 game. Find the cheapest price available for your chosen XBOX One game. Don't miss a money saving post! Receive alerts when a new post is added to the site. © 2015 GamePricer. All Rights Reverved. GamePricer is a participant in the Amazon EU Associates Programme, an affiliate advertising programme designed to provide a means for sites to earn advertising fees by advertising and linking to Amazon.co.uk. GamePricer is currently in beta. Many bugs will be fixed and new features will be introduced before the final release. If you notice any bugs or have an idea for improvements we'd love to hear about it. Thank you in advance for your feedback and support.